It's said that Edwin Bibby was born on November 15, 1848. Lancashire, the famous wrestling county of England, was his birth place. He got his start at grappling while still in his native country. As any good Catch wrestler can, Bibby was able to adapt against any variant wrestling style and in England especially there were an abundance of styles. Through-out the '70s he made a big name for himself all across Great Britain before moving to America in 1879 where better money could be made. Bibby drew attention toward himself in America. I don't believe that he was the first one to appear in America with this new style, however, there's no doubt he was the first one to really bring attention to it. One of his chief opponents was Duncan C. Ross they 'popped' Catch-as-Catch-Can wrestling in America. 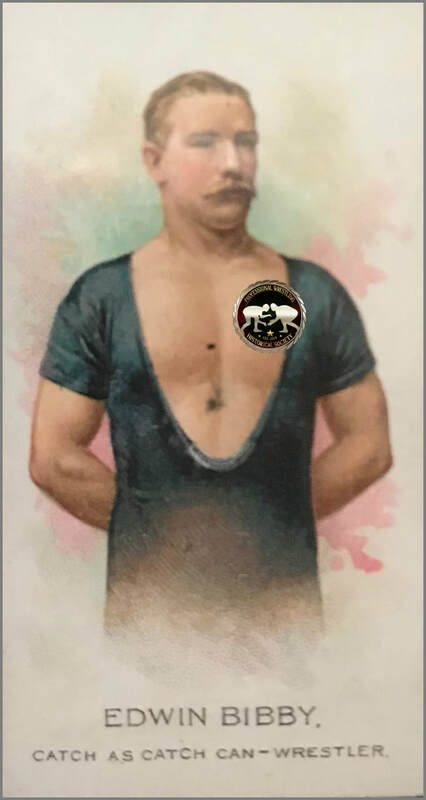 So popular was the style that on January 19, 1881 Bibby defeated Ross to become the American Catch-as-Catch-Can Champion. About a month later Bibby met Captain James C. Daly and won what appears to be a totally different and equally new version of the American Catch-as-Catch-Can Championship in the same venue he'd defeated Duncan C. Ross. For the next year and a half Bibby would defend the title successfully holding onto it until fellow countryman, Joe Acton, defeated him for it on August 7, 1882. As was often back at this time Bibby would still claim to be the champion in areas where he could get away with it. From there it was clear his career was never going to reach the same height again. He'd still be competing against the top wrestlers of his time, but normally coming up on the losing end. With enough money secured by 1888 Bibby would retire from in-ring competition and focus on training his sons, also refereeing on occasion. Over the course of his career he wrestled in front of Queen Victoria at Prince Albert's Court. Was presented with a personalized trophy in the shape of the Statue of Liberty for becoming the American Heavyweight Champion (It was often billed in papers as the world version) and also he was awarded with a silver championship for it. Edwin Bibby wrestled every big name there was no matter what style of wrestling was being used and helped solidify Catch-as-Catch-Can as a wrestling style in America. He is said to have passed away in 1905 of Rheumatic fever. Before that though back in England after quitting the wrestling game he worked in an iron factory. Bibby was never the most popular wrestler in England and America he always seemed to be overshadowed by Joe Acton, but, Bibby did pave the way for catch-as-catch-can wrestlers to go to America and get real recognition, and eventually for the style to totally engulf the sporting minds of the U.S.A. as it became the number one form of professional wrestling in the whole of the North of America.